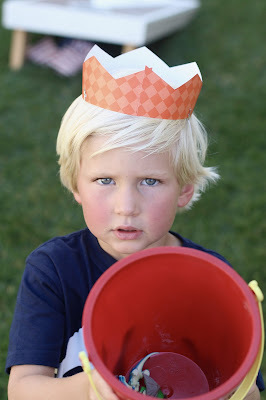 I tried to get Liam super involved in the planning of his party this year. I was open to anything & everything! Turns out he pretty much wanted the exact same backyard party that has he had every year. The only new additions were that he insisted upon a piñata (just like Finn's party), but his piñata would have candy inside! 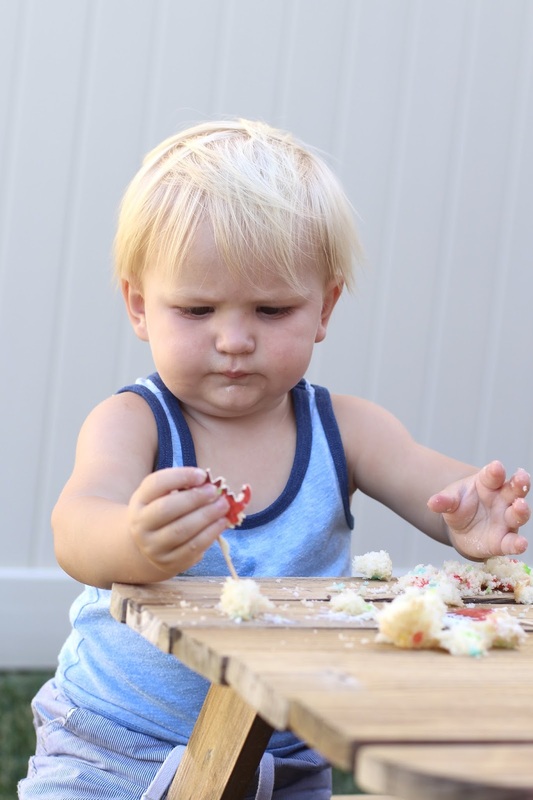 And he wanted to make sure there were cupcakes for everyone. I suggested some different themes to him, since his creative juices weren't exactly flowing, and dinosaurs was decided! He's really gotten super into them. He's convinced that we may find some dinosaur fossils on one of our camping trips. Which is actually quite possible here in Utah... so we'll keep his dream alive! Since it was a hot evening with temps in the upper 90s, we decided to keep the food inside but still encouraged the kiddos to play outside. 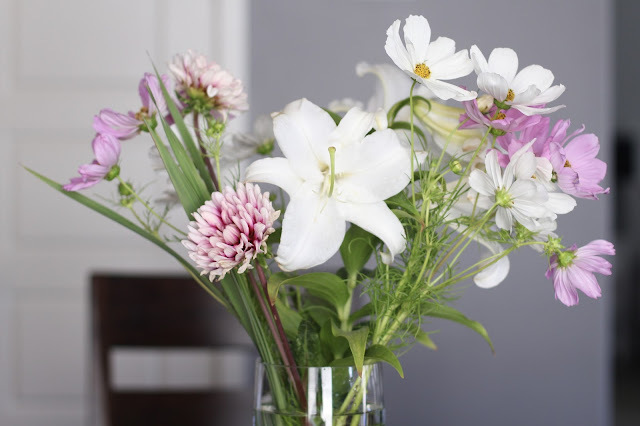 I kept the décor to a relative minimum, decorating with mostly just photos of Liam, fresh flowers from the garden, & a few special dinosaur touches. 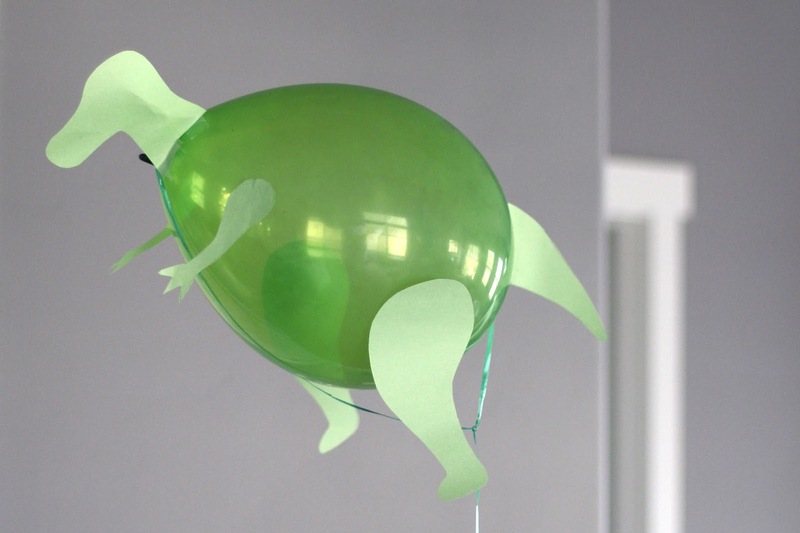 The dinosaur balloons were all Conor! I only managed a photo of the T-Rex, but they were all impressive, especially the Stegosaurus! And for an activity/party favor we did shovels & pails for all the kids. Then we buried 30+ dinosaurs in the sandbox for a big ol' dinosaur dig! I was pretty damn excited for this, but it didn't exactly happen as I imagined... I had Conor bury them pretty deep, so that the activity would last awhile. This instead ended with a few kids in tears over not be able to find a dinosaur within a few minutes... Oops! So there were just as many parents digging as kids! We tried to keep dinner simple, since Conor & I always tend to go overboard on the food and over exert ourselves. Brats & fruit were on the menu, two of Liam's favorites. We had a whole bar of toppings, cream cheese included (which is such a Seattle thing)! 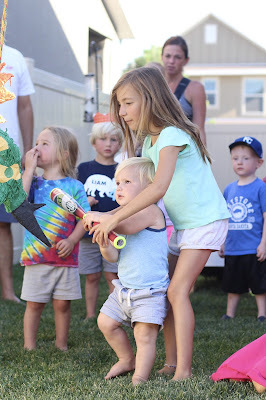 For the piñata, we let all the kids have a go at it (youngest to oldest), yet no one broke it open. So then the birthday boy got to have an endless amount of swings and finally all that candy (and dinosaur stamps) rained down! 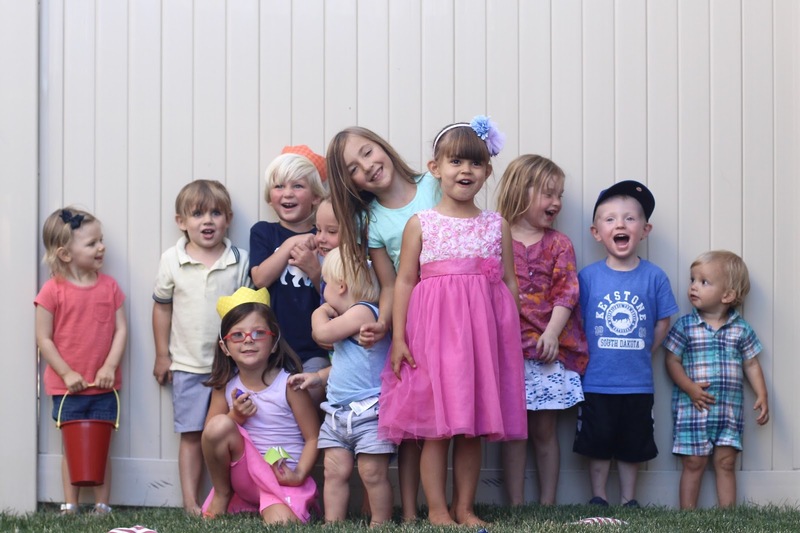 There were 15 kiddos total plus tons of babies! It was a little bit of chaos, but so so much fun! I felt like the party went by in a blur and that it was nonstop the whole time. Apparently this was a big event that we should have been training for, ha! But I know that all our guests left with full bellies & big smiles. Party success!!! After all the guests left just as the sun was setting, we decided to give Liam his present from us... A pedal bike (no training wheels!)! His face as we brought it out is an image I will never forget. Such excitement! 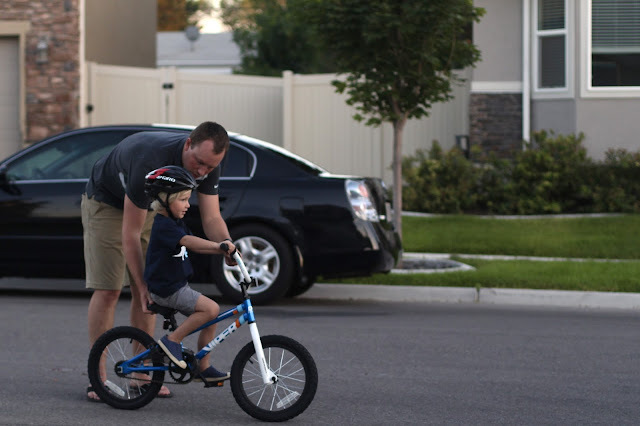 He got on right away and so began his very first bike riding lesson. He was already a pro on his balance bike, so I knew he would take to the pedal bike quickly. Spoiler alert: three days in, he was already an awesome rider. He's still figuring out how to get started and how to break, but we are so proud & amazed at his progress! And since Liam's birthday falls on a popular Mormon holiday (Pioneer Day), fireworks are also a thing! Even bigger than they are on the fourth of July! We had let Liam pick out a bag of fireworks, so we spent that last hour of the day with sparklers & other goodies. Then once it was pitch black out, the neighbors started up with their big show. A perfect way to end his party day! 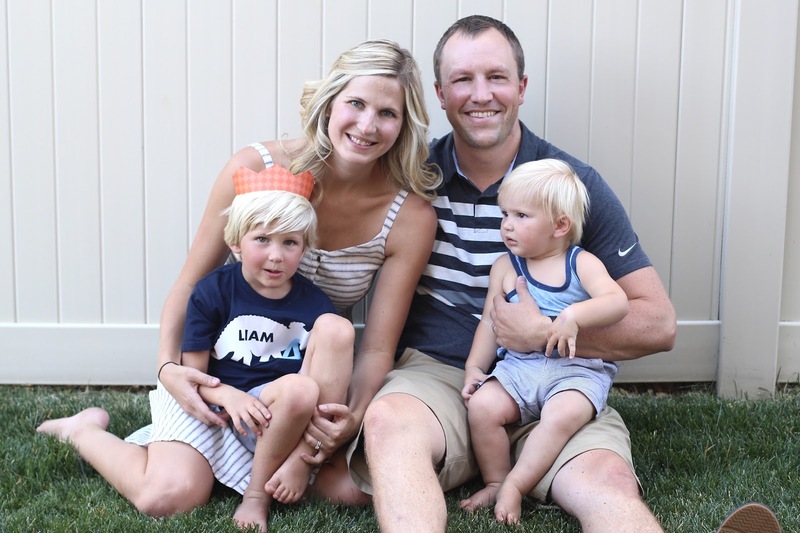 A big thank you to all who celebrated with us and to those who sent their well wishes! Our 4 year old loved his celebrations! It's going to be a good good year! 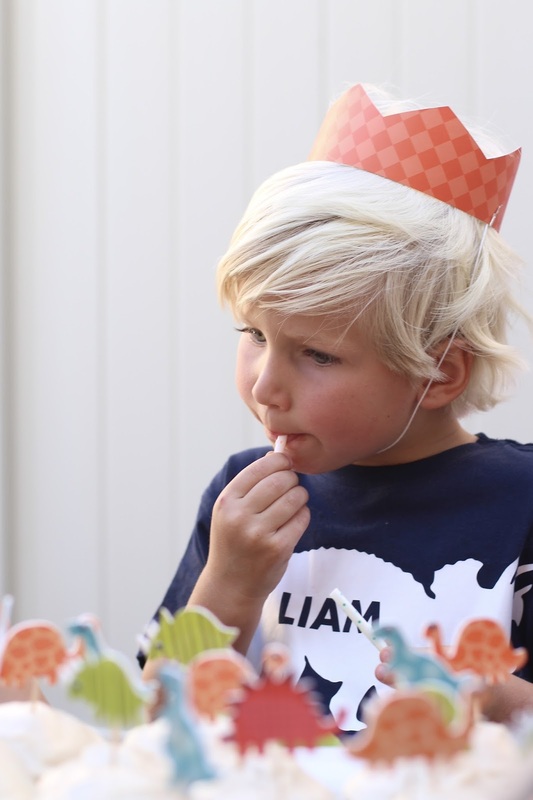 I absolutely love everything about Liam's party! The baloons, decorations, food, everything! Great job. 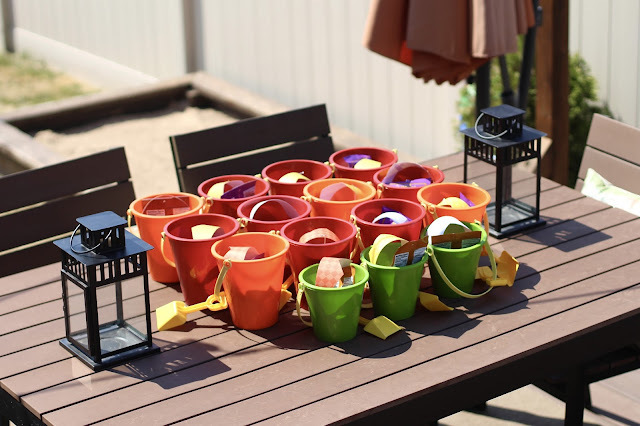 Love the idea of burying dines in the sandbox too. I cracked up that they were buried so deep and upset some of the kids. Oops! It's the year of bicycles. Cam loves his too. Such a cute party & cute little guy! I love the dinosaur theme... All your details are absolutely perfect! Noah right now says planes, but I'm starting to think dinosaurs would be so fun! I love his birthday shirt and those balloons are amazing! I wish I got fireworks on my birthday! LOVE it, Laura!!! Perfect party for your handsome boy! I love it all!!! 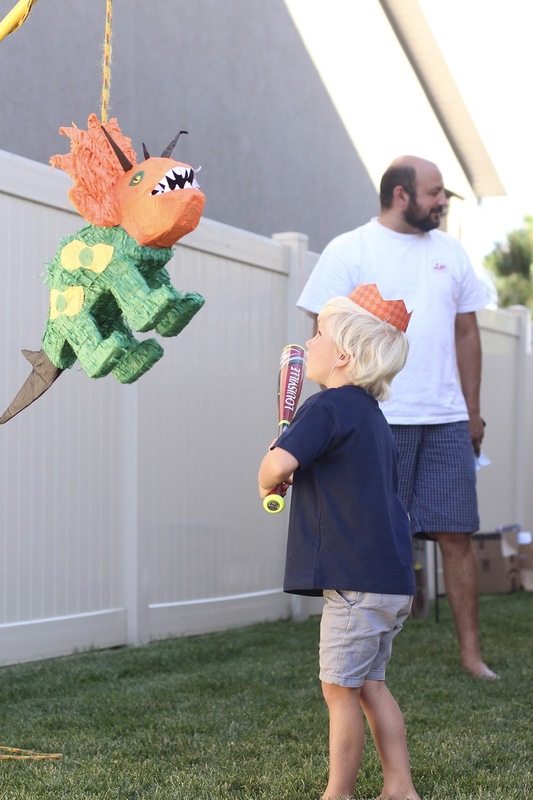 That pinata dino is a wee bit creepy though. Too funny about burying the dinos too deeply. Sounds like a great party though esp with fireworks to end! In love with this theme! I really wanted a Dino theme for Ben's first but I decided to save it for when he is a bit older. 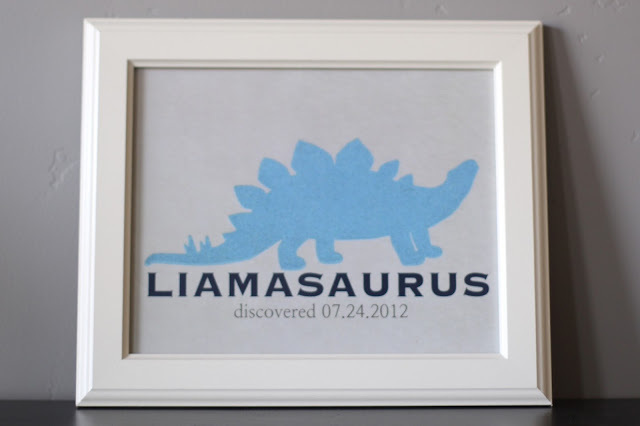 I love that finding a fossil for Liam is an actual possibility, I mean how magical would that be for him? This was the perfect party! 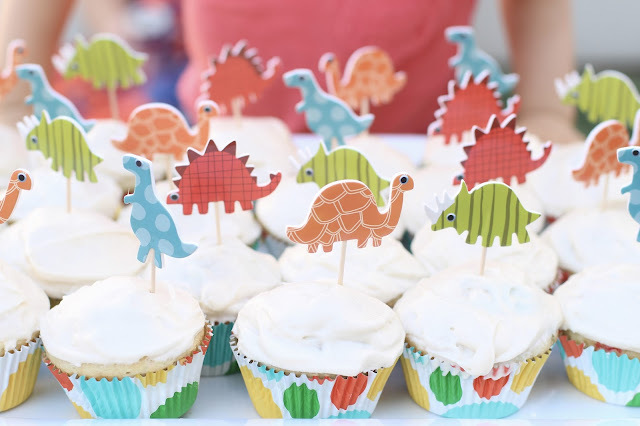 Such a cute party theme and details! Love the dinos in the sandbox idea! Perfect! Looks like a fun party! Love your hubbys balloon. I think we may be having a Dino party in October, so I may have to come back to this for inspiration. Liam looks so grown!!! The dino party was a smash hit!! Those balloons were a genius touch (nice work, Conor)! 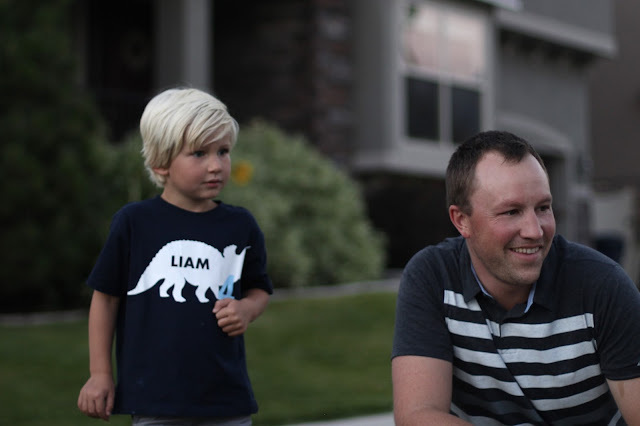 If you have a minute, here are a few dino sites that are hopefully not too far from you, and maybe Liam could do some digging to really find those dino bones?! Love everything about this!! 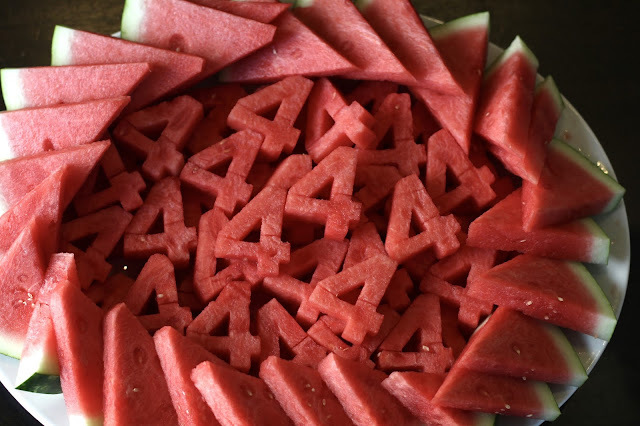 But I think the watermelon's that was cookie cut to make a four is my favorite!! So adorable!! Such a sweet and great theme! Great job on the balloons. Those are great. Happy belated birthday to your sweet boy! I love the minimal decor and the dinosaur balloons. Sounds like such a wonderful party! My son went through a dinosaur stage and it surprised me that he could pronounce the dinosaur names with more ease than me. Such a sweet little party! I love how simple and fun it looks and sounds. 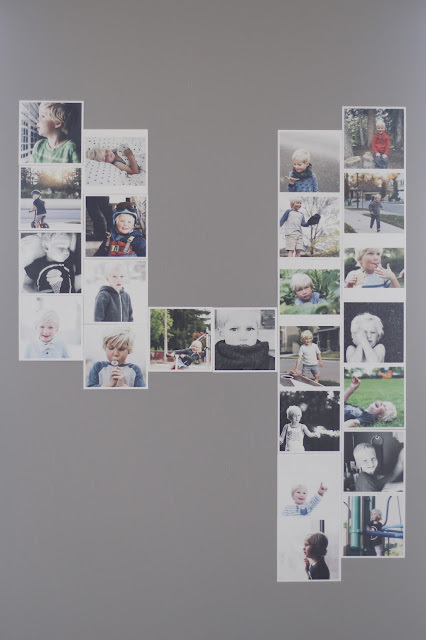 Happy Birthday to your little man! What fun! Great party and I love what Connor did with the balloons. Very creative :) We always go overboard with the food for a party too. I get all crazy and end up having WAY too much leftover. I want to come to one of your backyard parties! ;) Looks like a great time for everyone--especially the birthday boy with his new bike!!! Oh my, this looked like such a fun event! I love how many kids ended up coming. It is such a great time for a birthday party. And, I adore the theme! You guys did an amazing job! What a great birthday party! I love the photos made into the number 4. Where did you have the square pictures printed? Great pictures! Oh my, such a fun party! Love all your ideas! :) And that dinosaur balloon is adorable! 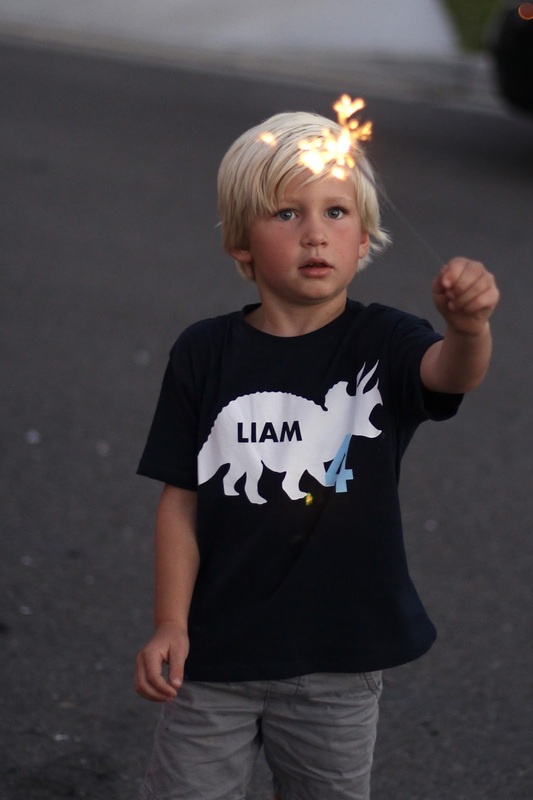 Happy 4th to Liam!